Where was the first skeleton of Supersaurus found in the United States? The “home” of the Supersaurus—thought to be one of the world’s largest dinosaurs—is the Dry Mesa Quarry located on the Uncompahgre Plateau in western Colorado. This site was first explored in 1972 by Ed and Vivian Jones, amateur paleontologists from Delta, Colorado. It is also home to another large dinosaur, the Ultrasaurus. A new and much more complete specimen of Supersaurus, nicknamed “Jimbo,” has been found in Converse County, Wyoming, and is on display at the Wyoming Dinosaur Center. 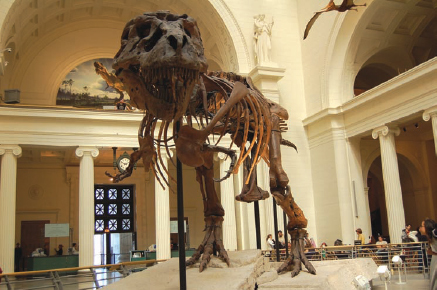 The most famous T rex fossil ever found is named “Sue,” who is displayed at Chicago’s Field Museum. A replica can also be viewed at Walt Disney World’ Animal Kingdom in Orland, Florida (Big Stock Photo).